Find your inner organization with these literature organizers. And outfit your office with a space saving solution. Store stationary, forms, supplies and organize projects with ease. Cabinetry is formed from compressed wood with a laminate finish and has a solid fiberboard back for strength and rigidity. Strong hardboard adjustable shelves form letter-sized compartments. 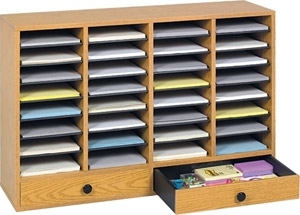 Includes two drawers for storage of writing implements and small office supplies. Black plastic molding complements finish while doubling as a convenient labeling area (labels are included). Mix and match with additional organizers with or without drawers to form a custom storage unit to meet individual needs.